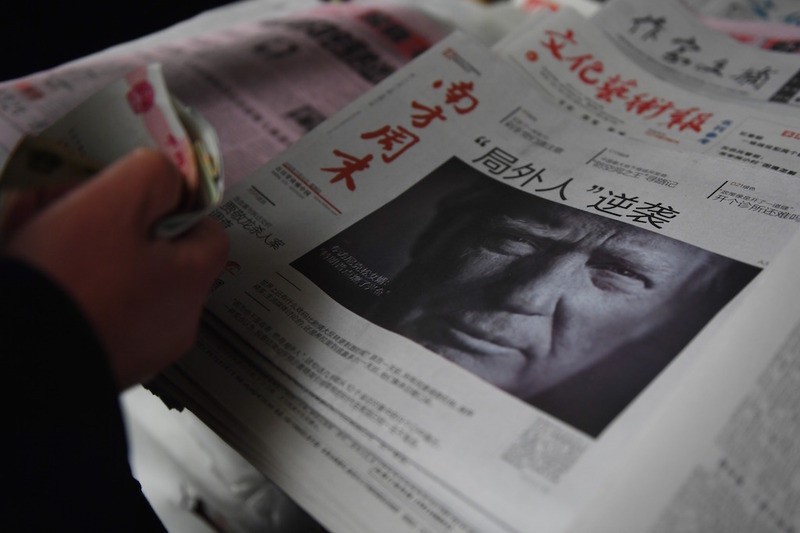 A Chinese newspaper featuring Donald Trump on the front page and a headline that reads ‘Outsider Strikes Back,’ in Beijing, November 10, 2016. Over the past year, Donald Trump has vowed to “utterly destroy” ISIS, considered lifting sanctions on Russia, promised to cancel the Paris climate agreement and “dismantle” the Iran nuclear deal. But many of his most inflammatory statements are directed at China. He has promised to label China as a “currency manipulator,” suggested he will dispense with the “one China policy,” and threatened to slap a 45 percent tariff on Chinese imports. His nominee for Secretary of State, Rex Tillerson, has said China should be barred from accessing the islands it built in the South China Sea. Trump leases office space to the state-owned Industrial and Commercial Bank of China, and his son-in-law and advisor Jared Kushner is in talks with Chinese insurance conglomerate Anbang. Is the relationship between the United States and China destined to start off on a negative footing under President Trump? The persistent pattern of rhetoric from Mr. Trump and his foreign policy team sounds like a team of enraged bulls charging into a china shop. Pun intended. Viewed from Beijing, where I am based, it seems that during the entire U.S. presidential campaign season, “Let’s get tougher on China” emerged as a consensus message across the political spectrum. Voices for a reduction of confrontation were few and effectively cast aside. Secretary Clinton, the Democratic candidate, was reported to want to “ring China with missiles” if her campaign prevailed. Trump not only spoke of China in relation to the American economy and society in a mode that echoed America’s “Japan-bashing” fever of the 1980s, he also directly touched the most sensitive nerve of the Chinese government and the country’s citizens: America’s position on the status of Taiwan. An overwhelming majority of Chinese citizens have been able to attain a life better than their parents, thanks to 40 years without a war between China and a major power, America included. War over Taiwan (or the islands and rocks in the East Asian seas) would create at least a 50 percent chance of destroying hope of similar progress for our next generation. Is China being singled out by the United States? If one judges by mainstream commentaries in the Chinese media, the answer is an overwhelming “Yes.” In the American media, answers to such questioning amount to a resounding “No.” Media in both countries represent solid senses of self-righteousness. As such, it is nearly pointless to try to argue for joint efforts leading to common ground over what has caused the bilateral ties to come to the present stage. The time has come, however, for China to address Americans’ seemingly pervasive sense of vulnerability by stating that a harmonious, prosperous, powerful, yet responsible United States constitutes part of the favorable external environment that China wishes to have. At recent academic conference sessions held in both China and the U.S., I tested this articulation and received mixed reactions. Yet, it may well help answer the justifiably salient question on the minds of many Americans: Now that China’s capacity to compete with the United States has risen in some areas and seems sure to rise further, what does China want? An alternative approach is to continue to urge each side to use history as a mirror—a reason against the use of force as a means of conflict resolution. The nagging challenge in this approach is that Americans and Chinese rarely agree on the causality of major conflicts in history. In addition, each side not only has a strong belief in its own reasoning but also tends to reinforce traditional beliefs when it feels aggrieved. It is not for China to influence and change America. Yet, since China has such a consequential relationship with the U.S. at hand—not just with the incoming Trump administration but into the indefinite future—it is worth suggesting that China come up with a mega-narrative—like the one suggested above—about the relationship that guides competing interests at home and also speaks to concerns in American society. It’s not just Russia, indeed. While it’s received far less press coverage, Beijing has many simple methods of exploiting Trump’s behavior in a way that would be detrimental to the interests of America as a whole. To take just a small example involving Chinese banks: The state-owned Industrial and Commercial Bank of China is the biggest commercial tenant of the Trump Tower; its lease is reportedly up for renegotiation in October 2019. Bank representatives could offer excellent terms, and ask for something involving international policy—anything, really. Records of those conversations could leak. The same thing could happen for negotiations of the 30 percent stake Trump owns in a partnership that owes approximately $950 million to different lenders—including the Bank of China. Unlike Moscow, Beijing probably didn’t want Trump to win. And for a variety of reasons, including the importance of the Sino-U.S. relationship, and the extreme focus on domestic issues, among others, Beijing doesn’t want to appear to have meddled in U.S. domestic politics. Instead, Beijing benefits greatly from the discrediting of the American system. Why? Because for some Chinese liberals, American-style democracy represents the most attractive alternative to China’s one-party rule. The more venal and corrupt Trump and his advisors seem, the less soft power American democracy has in China. And that, or so the thinking appears to be, improves the Chinese Communist Party’s grip on power. To answer this question, it is helpful to consider how the world looks from the perspective of Chinese policy-makers. First, they preside over a farflung internal empire with several dissatisfied populations that would like more autonomy or even full independence—the Tibetans, Uighurs, Hong Kong people, and (as Beijing sees it) the residents of Taiwan. Anything that contributes to Beijing’s difficulties in holding this empire together (or in the case of Taiwan, bringing it together) is an existential threat. Second, the vast territory of China lies vulnerable to strikes from the United States, which regularly sails and flies close to China’s seacoast and has tens of thousands of troops stationed on the soil of U.S. allies that are close to China. Such a position of vulnerability to foreign attack would not be acceptable to security policymakers anywhere, and China will naturally work to change it. This does not necessarily mean expelling the United States from Asia, but it means at least attaining a robust presence in the South China Sea and other waters within the so-called first island chain, and the ability to move at will beyond the first island chain. Third, to keep its economy growing and its people compliant, China needs secure access to raw materials and markets. This doesn’t necessarily mean a U.S.-style global basing system, but it does mean a blue water navy that can protect shipping and the capability to send at least small forces to distant places on the globe. It also means that China has an existential interest in the low-tariff global trading system that has been built up through the WTO. Some strategists have identified these interests as potential pressure points that could induce China to comply with American demands. But for China, these are “core interests” not just in name, but in fact. The U.S., of course, has its own core interests, including in its existing security posture in Asia and its own economic health. I do not advocate that the U.S. yield to Chinese interests at the expense of its own. But we should recognize that attempts to threaten Chinese interests will not produce more cooperation but less. We’ve seen in the last several weeks an unprecedented level of policy incoherence from the incoming president and his team. We expect presidents to change policy, but the continued inconsistency and lack of coordination between his tweets, statements, and the remarks of his advisors and nominees adds up to enormous uncertainty about what U.S. policy toward Asia will be, other than sound bites and tough talk. Unpredictability in foreign policy is a principle that Trump espoused on the campaign trail, and we’re seeing what that looks like in practice. The three biggest risks in U.S.-China relations under Trump are over Taiwan, trade, and the South China Sea. Trump has suggested that he wants to link at least the first two issues, increasing the risk of confrontation with China on multiple fronts. On Taiwan, China is unlikely to compromise, meaning that we’re likely to see a cross-straits crisis if Trump decides to abandon a One China policy. If Trump follows through with his campaign promises to slap massive tariffs on Chinese goods, we’re more likely to see a trade war. And if Trump proves willing to sell out Taiwan in exchange for some Chinese concessions on trade and currency, we could see tectonic shifts in Asia, as Taiwan, Japan, and South Korea decide to go it alone, no longer viewing the United States as a reliable partner or ally. In the South China Sea, there is the perennial risk of escalation from an incident at sea or in the air. It remains unclear whether Tillerson’s suggestion that the United States deny China access to islands in the South China Sea reflects an inexperienced mistake or a new policy stance—amounting to a blockade that the United States would have difficulty enforcing and which Beijing would likely view as an act of war. The difficulty of interpreting these kinds of offhand and inconsistent remarks only adds to the risk of conflict between two nuclear-armed powers. The Trump and Tillerson bluster about and to China—over trade, currency manipulation, Taiwan, the South China Sea—may be meant as an initial bargaining position. Trump suggested as much himself when he said to The Wall Street Journal last Friday that “everything is under negotiation including One China.” It is apparent to most China scholars and foreign policy specialists that such an approach is potentially disastrous for the U.S. relationship with China. But it is not at all unreasonable to suspect that Trump is thinking more about his business interests than the national interest. And that helps explain the crazy disjuncture between Trump’s open affection for Russia and gratuitous finger-flipping at China. Whether such a “Source E” verifiably said this or not, it is an important observation. We now are familiar with the pattern by which, on an almost daily basis, Trump brandishes something publicly outrageous to distract from something more substantively disturbing. Democratic National Committee hacking, the bizarre Trump-Putin bromance, the dirty dossier and all the rest of this Russia story—scandals that against all principles of public relations Trump keeps dragging our attention back to—these are certainly shiny media objects. The question is, what is Trump using them to distract us from? A few days after winning the U.S. presidential election, Trump suddenly won an intellectual property patent case involving the “Trump” name, a case that had been in Chinese courts since 2006. He holds 72 patents in China already, and since April 2006 he has applied for at least 45 more patents on his various name brands in China. Trump tower registered these applications well after Donald embarked on his run for president, some after he clinched the Republican nomination. Should the People’s Republic of China state now grant these patents, that would arguably put Trump in violation of the Emoluments Clause of the U.S. Constitution (they won’t be the only thing). But the point here is that Trump is and has been clearly bent on expanding business in China, even as he rails publicly against Beijing and pokes his finger in the most sensitive of spots: the status of Taiwan. Trump’s belligerent public posturing about China is bewildering if his goal is a stable and developing U.S.-China relationship, of mutual benefit to both countries. But it makes a lot more sense if he’s anteing up these crazy policy stances to encourage quiet Chinese actions to benefit Trump businesses. I don’t see any reason to rule out rank, meretricious venality as a driver behind Trump’s China positioning. China is in the midst of trying to hold together an economic system that is going through massive transformations, and under a great deal of stresses (both domestic and international). Given such challenges, the Chinese leadership’s central goal is to maintain levels of growth that will be sufficient to keep those living in China at least somewhat happy. To accomplish such a task, the Chinese need a stable global trading system. Disruptions within such a structure would have a profound negative impact on the health of the Chinese economy and, by extension, raise questions about the stability of its political system. As a result, it is safe to surmise that Beijing will do all it can to avoid a trade war with the United States. If the challenges to Xi from Donald Trump’s America were limited to the economic arena, one might reasonably maintain a sanguine view regarding the prospects for a relative degree of peace and stability between the U.S. and China. However, appearances notwithstanding, economics and trade may be the least contentious issues within the U.S.-China relationship; indeed, these concerns pale in comparison to the question of Taiwan. The island’s potential as a flashpoint was on particular display in the recent bombastic Wall Street Journal editorial written by John Bolton. In this piece, Bolton, who may very well be on the outside looking in when it comes to the Trump administration’s foreign policy team, ups the President-elect’s earlier tweets about Taiwan by openly calling on the U.S. to consider, for the first time since the 1970s, deploying American armed forces on the island. To date, Beijing has still not really taken the bait on this front, consistent with their relatively mild public response to Trump’s December phone call with the President of Taiwan, Tsai Ing-wen. However, there is also no issue on which the Chinese leadership is less flexible than Taiwan. Taking note of such intransigence does not then imply that one must acquiesce to Beijing’s One China Policy. Rather, it is to contend that if one thinks it is in the American interest to question such a line, there are, clearly, more productive ways to begin such a conversation, and real risks involved in even starting it. In short, the string of Taiwan tweets, statements made during confirmation hearings, not to mention Bolton’s just published editorial on the subject, have surely left Xi, and the rest of the Chinese leadership, seething. While they have so far demurred from taking such aggravation public, it is safe to assume that rather soon after January 20 we will see an increasingly hard line coming out of China regarding Taiwan. The fear would then be that Trump will respond to Chinese actions in kind, and we will all be dragged into a downward spiral of deteriorating relations that could become quite dangerous quite fast. Such a dynamic would have wide ranging negative implications for Taiwan, China, and the United States. One need not appease China in order to move forward, but, provoking it on Taiwan is unlikely to have a positive result for anyone involved. I am not convinced that a “pervasive sense of vulnerability,” as Professor Zha states, is at the heart of recent comments about China by President-elect Donald Trump and future members of his administration. Rather, it would seem that discomfort with the status quo in the U.S.’ relationship with China and the Asia Pacific is seen by people around Mr. Trump to have been failing the United States and need rectifying. Whatever the merits of such views, any threat to the status quo which has allowed millions of people in China, as Professor Zha writes, to attain a life better than their parents will be perceived as potentially detrimental to China’s interests and aimed at lowering its global status. As this resurrects the demons of the “Century of humiliation,” the reaction to the prospect of a changed status quo—a status quo where China almost always got away with territorial expansionism, a tightening crackdown on civil society and unfair trade behavior, not to mention the bullying of sovereign states on the Taiwan “question”—across China has been one of alarm. Such alarm has in turn emboldened more radical voices in Party-controlled media in China, creating an atmosphere of embattlement and compelling the Chinese Communist Party (C.C.P. ), which has staked much of its reputation on the continuation of China’s rise to its “rightful” pace as a major power, to sound as intransigent. My fear is that escalatory and increasingly inflammatory remarks on both sides of the divide will marginalize more pragmatic voices and undermine efforts to de-conflict the relationship from the outset. With Mr. Trump and his close aides touching on two “core” issues of the C.C.P.—“One China” and the South China Sea—the rhetoric risks inflaming policymaking and will add friction to the always fragile relationship while increasing the risk that signals will be misinterpreted or overinterpreted, which can quickly lead to accidents and escalation. To avoid such a scenario, the two sides must make sure to tone down the rhetoric and strengthen communication channels to minimize the risks of error or miscommunication. While some correctives to the status quo may be advisable, the Trump administration will have to clearly communicate its intentions and rationale with Beijing so as to reassure it that such moves are not part of a strategy to undermine China’s development and prosperity. China has grown accustomed to being practically unchallenged during its rise over the past two decades; it is only natural, once it has become powerful enough, that the conditions that permitted such a rise may be challenged now that the entire regional system threatens to be brought into disequilibrium. China’s takeover and militarization of the South China Sea, a critical sea transportation node, and position on Taiwan, which is increasingly out of sync with reality in the democratic nation of 23 million people, constitute the type of dislocations that are bound to prompt reassessments of the status quo. One of the most—and to some, the most—important issue within the Sino-U.S. relationship is managing North Korea in light of Pyongyang’s ongoing development of its nuclear program, in particular its production of missiles capable of delivering a nuclear payload to the West Coast of the continental United States. In the surreal and contentious Twitter-driven political atmosphere that continues to swirl around President-elect Trump’s transition, it is debatable whether the absence of North Korea within the discourse so far is alarming or (tentatively, at least) somewhat reassuring. Nevertheless, at some point in the near future, President Trump and his foreign policy team will have to confront this issue, and the unique and unenviable role that China plays within in. Washington and Beijing have two very different sets of acceptable outcomes that are nonetheless compatible, if we choose to understand each other’s position. For China, its North Korea-based existential crisis has little, if anything, to do with its smaller neighbor’s nuclear capability. After all, China has been in American and Soviet nuclear crosshairs for more than half a century. Rather, Beijing has a very real and abiding interest in maintaining the status quo on the Korean peninsula, that is, the continued existence of a viable North Korea. A sudden North Korean implosion would send millions of starving refugees streaming across the Sino-Korean border, a backwater that is not even remotely as fortified as is the border between the two Koreas. This would plunge China’s economically-depressed Northeast squarely into crisis. This influx of unskilled and shell-shocked refugees would place an unbearable strain onto China’s already-slowing economy and possibly a regime-threatening political crisis. In the event of a German-style unification, China may well find U.S. forces deployed unacceptably close to its sovereign territory. For the U.S., by contrast, domestic politics in North Korea are largely irrelevant. What is solely of concern is its nuclear program and the threat it poses for the United States and its allies in the Pacific theater. Can these two sets of concerns be reconciled? There is no reason why not, but doing so involves a degree of diplomatic and strategic understanding that the Trump team—from its poorly-handled contact with Tsai Ing-wen to its bellicose language about the South China Sea—has yet to demonstrate. Eventually and inevitably, we will need China to help us thread this needle. The Trump team’s insulting, belittling, and antagonizing of Beijing makes little, if any, sense. I am writing from Beijing, where colleagues and I have been talking with local experts about the U.S.-China relationship. In planning this visit some months ago, I had no idea my Chinese interlocutors and I would be engaging together in an exercise in extreme speculation. I didn’t bring much by way of insight to the discussion table—my effort to read the tea leaves of the views and actions of cabinet nominees about China revealed collective incoherence. The statements made during nomination hearings for cabinet posts affirm that all we can confidently now predict about the Trump presidency is unpredictability. Added to the unexpected position taken by the candidate for Secretary of State on the already volatile South China Sea issue, it appears that there are also others on Trump’s team who are making the most of Trump’s inexperience to push agendas that, in the absence of any signs of a coherent policy, are rattling the region as a whole. The challenge is that the potential flashpoints are numerous and the climate is tense amid what has been—even ahead of Donald Trump’s election—intensifying distrust between the U.S. and China. In addition to possible crisis triggers in the South China Sea, rethinking Taiwan in U.S. security and punitive trade and investment policies, the Korean peninsula, politics in Hong Kong, and China-Russia or China-Iran cooperation are among the many issues that could lead to a peace-endangering collision between Washington and Beijing. When Trump was elected, many U.S. policy watchers in China felt that Beijing could likely work with him: Trump’s pragmatism and absence of ideological baggage appealed. As Trump’s inauguration date has neared, the mood among foreign policy experts in China to the changes afoot in Washington has become palpably less hopeful. They are now clear that the new Administration will be neither friendly to China, nor will it be advised by pragmatists. Those who work on Beijing’s policy toward the U.S. seem grimly prepared to resist overreaction in the coming months to apparent provocations from Washington that may be made in the absence of policy coherence and experience. If there is hope among experts in Beijing about the early days of the Trump Administration, it is that since there are so many potential sources of international insecurity that could affect the U.S., when the first crisis hits Trump-led America it does not involve China. Joining this conversation from Seoul, I’d probably be expected to write about North Korea as a flashpoint for US-China relations in the Xi-Trump era. It is, for reasons Andrew Mertha laid out, and I do worry about it, especially since I live within North Korean artillery range. But joining this conversation a tad late, in the immediate wake of Donald Trump’s inauguration, I have to wonder if the looming danger and unpredictable factor in the relationship is to found one level deeper than the issue set that we as experts focus on, such as trade war, cross-straits conflict, South China Sea tension, and Korean contingency. What I worry about is the abrupt emergence of a new kind of American nationalism as articulated in the foreign policy beliefs of President Trump, and what it might do when it collides with the familiar form of Chinese nationalism embodied by President Xi Jinping. Nationalism is not inherently a bad thing. It can be benign, even beautiful. It is the bedrock of the American experiment—look no further than the opening pages to the book that inspired the Constitution, Montesquieu’s Spirit of the Laws, where he writes “virtue, in a republic, is the love of one’s country, that is, the love of equality.” American political culture sustained that spirit of republican virtue for centuries, a genuine love of country and the ideal of equality which the Constitution enshrined and to which the nation aspired. When nationalism shifts its footing from patriotism—republican love of country—to xenophobia—resentful hatred of foreigners, then what was benign and beautiful turns into something virulent and pathological. It is the nationalism not of republican philosophers like Montesquieu and Jefferson, but of fascist strongmen like Mussolini and Hitler. In between those extremes lies a commonplace strain of nationalism that makes no claim to higher virtues like equality or freedom. It is a materialistic nationalism, not an idealistic one. It put the interests of the nation above all else. It fears for those interests’ being damaged in the world and resents any and all slights against its name. Orville Schell and I wrote a book about how that kind of nationalism weaves together many strands of modern Chinese history in a single phrase: “wealth and power.” Subsequently I’ve been struck by how the same phrase is central to political discourse in modern Japan and Korea (North and South). Little did I expect it to be at the heart of an American president’s inaugural address. In President Trump’s first address to the nation, he bemoaned the loss of “wealth and power” and made a promise to get it back. “We’ve made other countries rich while the wealth, strength, and confidence of our country has disappeared over the horizon… From this day forward, a new vision will govern our land. From this moment on, it’s going to be America First… Protection will lead to great prosperity and strength.” America’s role in Asia is predicated on its commitment to the common good and to universal values—these represent the foreign policy extension of republican virtue as practiced at home. In negating those values, President Trump undercuts the basis of America’s position. To act on no other principle but America First is far more damaging than withdrawing troops from South Korea or allowing militarization of the South China Sea. And if Trump should prove to be a hawkish leader, he will find few allies when he rattles his sword in the name of America Alone. This week, America’s nationalism, at least as expounded by its democratically elected leader, has become a lot more like China’s. I worry about what happens when they collide. Jeffrey Bader has recently pointed out that key foreign policies of the Chinese Communist Party (C.C.P.) are not good for the U.S.A. or the global community. Therefore, Bader concludes, a responsible China would concede to claims that the C.C.P.’s state mercantilism to win in industrial exports is an unfair practice of Chinese state neo-mercantilism which hurts other economies and unbalances the world economy. Trump is not wrong to try to pressure China to act more responsibly. A responsible People’s Republic of China (P.R.C.) would also find a way to back off from its expansionist and militarist policy aimed at turning maritime Asia, especially Vietnam’s East Sea (the Philippines’ West Philippine Sea and the P.R.C.’s South Sea) into a Chinese lake despite China’s negative impact on other governments in Asia. And Supreme Leader Xi would be doing something to prevent a provocative Kim dynasty from threatening the peace of the region and also would be seeking to institutionalize a peaceful modus vivendi with the government of the autonomous democracy on the island of Taiwan. Trump and his appointees have commented on these four issue arenas in ways which make many analysts worry that a Trump administration will make things worse. These commentators could be right. I do not claim to know the future of the international relations of the Indo-Pacific region. I suspect that no one knows. I do believe that India and Japan will have more of an impact on these matters than most analysts have so far in this debate allowed. But I also find that Bader is correct. The most important change needed to avoid worst case outcomes in the Indo-Pacific region is in C.C.P. foreign policy. I agree with many of my colleagues that we’re entering an uncertain and potentially dangerous period in U.S.-China relations. With the Trump administration now in office, there are at least four reasons for serious concern over policy towards China. First, we should be concerned about the potential consequences of a xenophobic and unprincipled nationalism, as John Delury points out. China is headed in this direction, and if the United States begins to do so as well, both countries could quickly find themselves caught in an escalatory cycle—whether it’s trade or security—fueled by politics at home. This ends well for no one. Second, we should be concerned that the Trump team’s first actions on Taiwan and the South China Sea have been to turn it up to 11, in the immortal words of This is Spinal Tap. Whether the Trump team is looking to gain leverage for negotiations on economic issues, believes the United States must take a more robust stance against China’s regional ambitions, or just doesn’t know what it’s doing, immediately questioning the One China policy and stating that the U.S. will prevent China from accessing the outposts it occupies in the South China Sea is dangerous. Rather than gain leverage for the United States, these moves are much more likely to cause China to call Trump’s bluff, thereby forcing the Trump administration into a corner where it either has to double down—making progress with China on a variety of issues tougher—or back down, showing China’s leadership that the new administration can be pushed around. Third, we should be concerned about the Trump administration’s economic policies towards China. More protectionism and tariffs not linked to a broader economic approach with China will hurt American workers and China’s economy, and will potentially spark a trade war that damages both economies. Furthermore, the withdrawal of the United States from the Trans-Pacific Partnership trade deal will weaken U.S. trade relationships in Asia, make China a more appealing market for Asian partners, and erode American credibility and leadership with friends and allies in the region. Fourth, we should be deeply concerned about the Trump team’s disdain for U.S. alliances. President Trump made no secret during the campaign that he views the United States as being ripped off by our allies, and in particular talked frequently about renegotiating the terms of the alliances with Japan and South Korea. He also made clear that he would be comfortable with these allies obtaining nuclear weapons. The consequences of these policies, if carried out, would be deeply destabilizing: China would feel emboldened to threaten U.S. allies; Japan and South Korea, among others, might feel the need to take assertive steps such as acquiring nuclear weapons; and others might see a retreating United States and rush to cut deals with China that could undermine U.S. interests. Exacerbating it all is a leadership of the U.S. government—President Trump, nominee for Secretary of State Rex Tillerson, White House Chief of Staff Reince Priebus, to name a few—who don’t know how government works and have no experience in international diplomacy. U.S.-China relations are in for a bumpy ride.